"Patience, Grasshopper" - Oddly Aroused! I apologize for the late comic everyone! This last weekend was a busy one with various things here and there delaying the goodness that is Oddly Aroused. We continue our story as Agnes rallies forth to her drab job in a drab office after giving herself the haircut to end all haircuts. Lets look in on her shall we as she tries to slip into the office unobtrusively…But let’s face it, she blends in about as well as RuPaul at a Shriners convention! Todays Sword and Sorcery cover is by the late great Earl Norem. In my opinion, he is one of the greatest artists to grace the covers of this well-loved mag. This was one of his few wraparound covers (if not his only one) that he painted for the series. 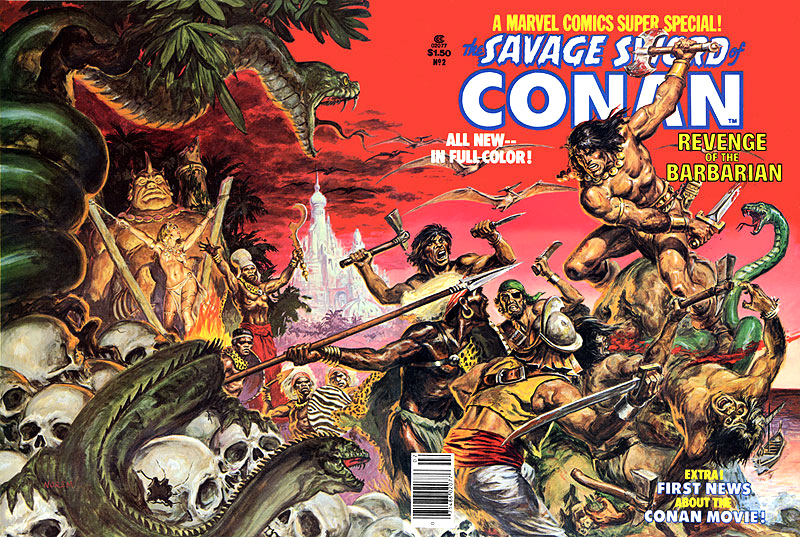 It’s all there and in your face in this cover; Giant snakes, dinosaurs, skulls, a savage battle, the hero hewing and cleaving, a wizard, a lost city and the ubiquitous female bound to a gruesome idol! What more could you want in a classic Sword and Sorcery cover?! There’s always one in every workplace. I usualy go for counter-banter myself. Works wonders. Great work as always Jim. Loving these covers. Thanks balthazar. I’ve worked at a lot of places and I find that certain archetypes run fairly consistently at every place I’ve ever been.